Stubborn people are all around us and it's worse when they are part of your family. Our of all the traits that a person can have that is one that I really don't like. Perhaps it's my stubbornness that causes me to not like this in other people but when their stubborn streak is apparent and they take it out on me then I am not pleased. 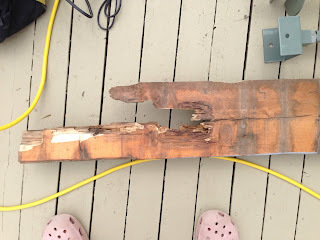 On March 10 my husband had a really bad accident at work (which we will never see any repercussions with the builder) and broke his heel bone and dislocated his finger. It could have been much worse, but that is not the point and my anger with this particular builder is for another time. Anyway, months later, a surgery, crutches, a cane, lots of physiotherapy (I think my husband see more of his therapist than me) this weekend we decided that we need to investigate the wooden stairs on our porch. My husband has not liked going up and down these stairs since the accident (for good reason) and this weekend it became very apparent how serious this type of accident really is! 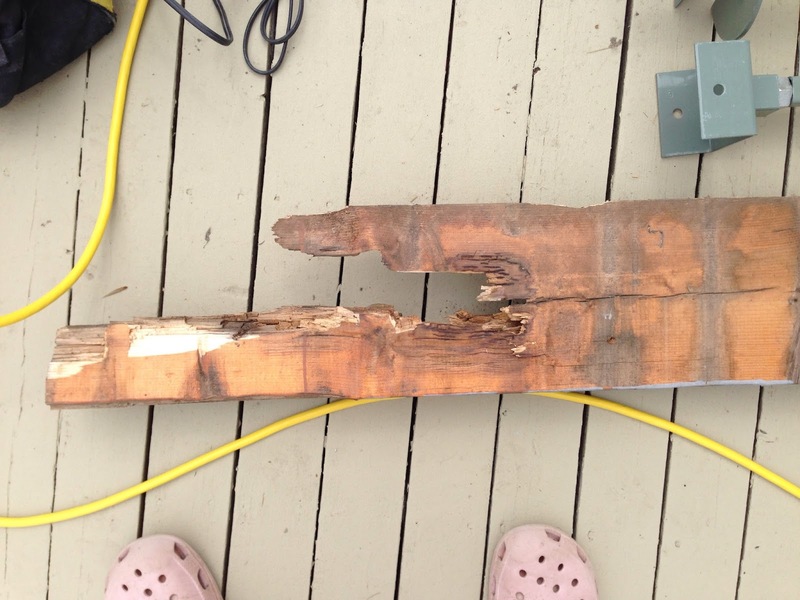 After removing the staircase, we discovered that there were a total of 4 screws holding the stairs up on a very rotten board. Now to the stubborn part. I give my husband credit in that he is determined to get this fixed as quickly as possible, but he also needs to realize that he cannot push himself. Last night after working on the deck all afternoon his foot began to hurt and we tried to think of why (perhaps that the physio therapist said to try not to use the pressure bandage, or that he was working on uneven ground for 4 hours, or both). This morning when he woke up his foot was still really sore and instead of icing an taking it easy, he pushed through and started working on the porch. He just stopped working as he is in so much pain that he can barely stand. This is where the stubborn comes in....he is in pain, I am just trying to help and he yells as me. We were told as soon as the Dr. gave the ok to walk on the foot again that pain is not gain in this type of injury and if you are in pain to stop. So instead of taking a day to recover, my husband works with this pain and probably can't go to work tomorrow, and will be off his foot for a few days. The kicker of all this is (now it's my pitty party) we are supposed to go on a holiday without the kids this weekend and go cave exploring, and a wedding and spending time on the beach. He will probably be sitting in the hotel icing his foot on pain killers. I am really glad that he is up and walking again, but I wish that he would take it easy for just a little longer...heel breaks can take from 6 months to a year to heal and it's only been 3 months! Stubborness is such a frustrating trait in other people, lol. Here's hoping you guys are enjoying your vacation!